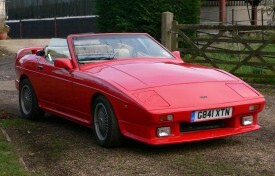 Having gone through the doldrums, the Wedge TVR has now become a popular and much sought after model. The 350SE was produced in a very low volume to celebrate the end of the era that began with the 350i. The special edition was powered by a powerful 3.9 litre alloy Rover V8 and enhanced with alloy wheels and Koni adjustable shock absorbers. Each motor car was also numbered. G841 XTN is number ten of twenty five and is listed on the Wikipedia website. We understand the mileage to be warranted and supported by MOT test certificates, although we should point out that in 2006, the vehicle was recorded as a Category D insurance loss, which the vendor believed to be mainly paintwork rectification. We are told that the TVR is in good mechanical condition; in December 2016, £1215 was spent on a full mechanical inspection and a brake overhaul, and nominal mileage has been covered since due to work commitments and a new house building project. The interior is tidy apart from the door trim mouldings; the right hand moulding is absent and the left hand one is cracked, apparently a common fault. The bodywork is presentable, apart from the front spoiler which has a small amount of damage and a missing rubber seal, but neither should be difficult to rectify. The history file includes MOT test certificates, invoices, two V5C registration certificates and the current, and an HPI report.